Lyrics Of Kya Hawa Kya Baadal From Movie - Allah Ke Banday (2010): A motivational song sung by Kailash Kher featuring him in the song video. Star Cast: Sharman Joshi, Faruk Kabir, Naseruddin Shah, Atul Kulkarni, Anjana Sukhani, Rukhsaar Rehman, Zakir Hussain. The video of this song is available on youtube at the official channel Cinecurry. This video is of 3 minutes 35 seconds duration. 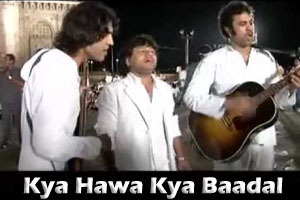 Lyrics of "Kya Hawa Kya Baadal"
Lyrics in Hindi (Unicode) of "क्या हवा क्या बादल"